In the last couple of months I’ve seen two of the saddest things. The first was the paralyzed squirrel that had spent part of the fall scampering around outside of Building 7, pulled only by its front legs. I guess someone must have been feeding it, maybe the nice lady who feeds the cats also brought something down for him to eat, because he was there for a few weeks or a month. The next to the last time I saw him was right by the service exit. He clawed his way out of the bushes and looked up at me as I was heading out with my bike to work, He paused and looked straight at me and I thought, “hope it gets better, you’ve been scrambling like this for a while.” I got on my bike and pedaled off, hoping I’d be able to stay un-paralyzed. When I was walking Lucky later that day I saw the squirrel about 20 yards from that door pulling autumn leaves up around himself. 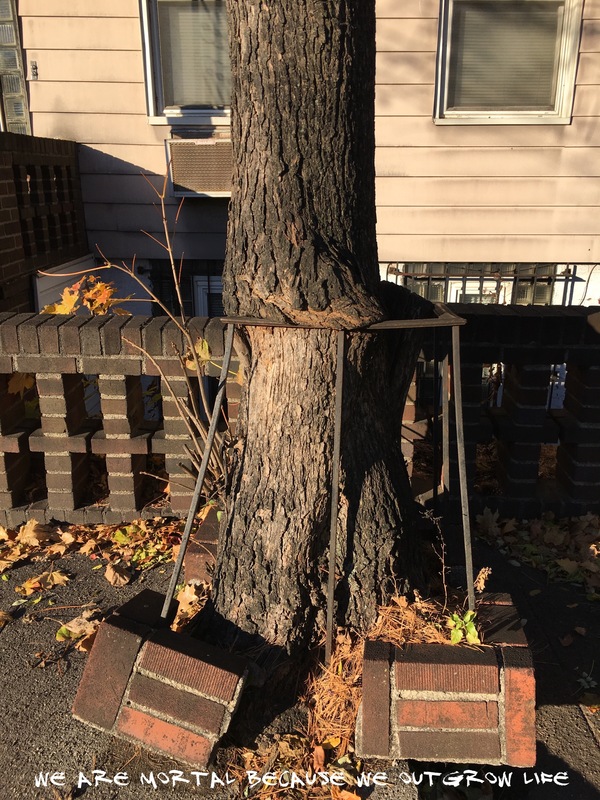 It was like he was making a little bed by one of the trees he could no longer climb. I guess I knew he was dying then. But why the cover of leaves? DId he want to stay warm? Did he know he’s soon be somebody’s dinner? Did he want to avoid being dinner? The wind blew and exposed his nonparalyzed upper limbs and head and he quickly pulled some leaves back over him. I said goodbye, because I knew this was his end. I was kind of sad, but also happy that I was aware of this struggle for life in nature. The other calamity I saw was on recycling day on the Upper East Side the day I went to the Whitney with Linda and Mary from California. I was running to the cafe that Lennox and Chandler were sitting at to bring the Calvin and Hobbs book I was carrying to them. On 76th street between Park and Lexington I came across a jumbo clear recycling bad that was full of maybe 30 Kodak rotating slide carousels. I had to know what the photos were of, so I tore a small hole in the bag and pulled out two slides from one of the slide-show carousels that people used to give slideshows before the internet made sharing and collating images so east. (I remember when one of my parents hippy friends came back from some exotic trip (Dan Deitz to Germany? Judy Geisman to India?) and we were all dutifully assembled to see one or two carousels of that trip with their commentary (as the adults got high and drunk). It was boring, though the images were interesting, as they got high and drunk the adults were less and less interesting. The two slides I got were of Sofia Bulgaria. 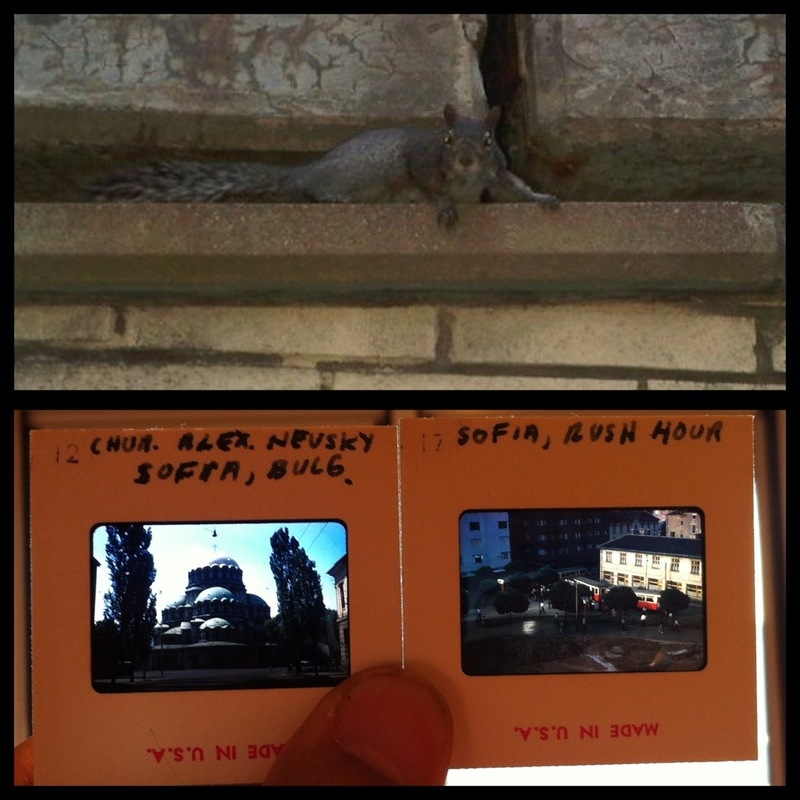 One was of the “Church Alex Nevsky” (that looked like a mosque), the other was titled “rush hour, Sofia” Both were lettered in sloppy fountain pen writing. I would imagine that the 10,000 slides in those thirty carousels were all also titled in fountain pen. Someone spend their life visiting Eastern Europe (& other places), taking photographs and editing them into slide shows. After each slide was viewed, labeled, carouseled the photographer-traveler, tourguide and slide-show purveyor would invite people to live vicariously though his travels. Alas, he dies and someone put these slides to the curb to be recycled. What treasures of a life were in those bags? What treasures am I saving for Mason or Chandler or Lennox to throw to the curb some day? Nothing so exotic as a trip behind the soviet Iron Curtain. Sigh.